I know I said February 27th last night, but the date for Skype Mobile with Video to go live for the HTC Thunderbolt is actually the 28th. We first reported back in January, that the video chatting service would not be live on the TBolt at launch, but would instead come as an update later on through the Android Market. That news hasn’t changed, we just now know exactly when it’ll be available. 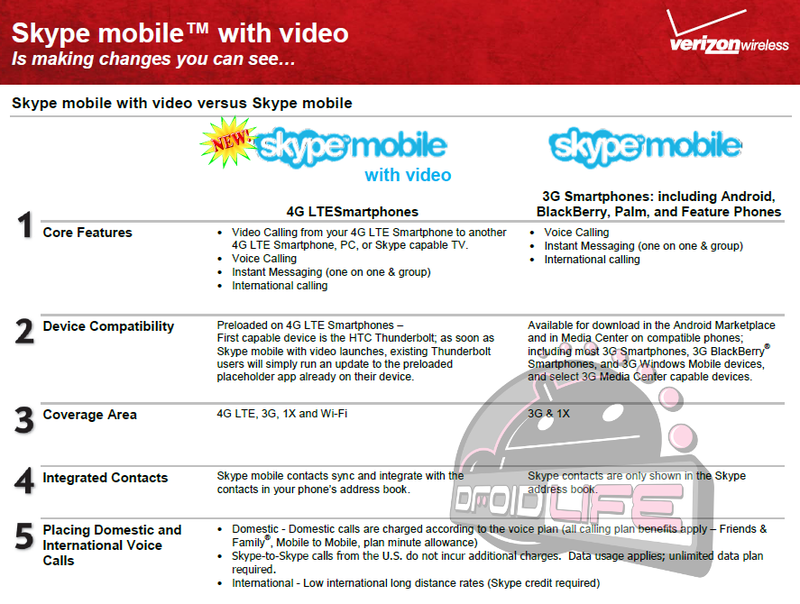 We’ve also received a comparison chart of the different versions of Skype from our friends at Verizon that highlights some of the new features we can expect once our new 4G LTE devices launch. The first thing that stuck out to me was the fact that Skype Mobile with Video will be baked into your phone’s address book, giving you quick access to video calls with your friends. It will also allow you to make video calls to other 4G LTE devices, PCs, and to Skype-capable TVs. And of course, you can make calls over 4G, 3G, 1X and WiFi which as we all know, is something a certain other phone can’t do. Now if only Verizon would stop teasing us on Twitter and bring us this goodness.